Place beef steak and 1 cup JD Barrel Bourbon Marinade in food-safe plastic bag; turn steak to coat. Close bag securely and marinate in refrigerator 6 hours or as long as overnight. Combine dressing ingredients; refrigerate. Combine lettuce, baby pear tomatoes, cucumber and 1 cup green bell pepper; refrigerate. Remove steak from marinade; discard marinade. Place steak on grid over medium, ash-covered coals. Grill shoulder steaks, covered, 12 to 17 minutes for medium rare (145 degrees F) to medium (160 degrees F) doneness (top round steak 12 to 14 minutes for medium rare (145 degrees F) doneness; do not overcook), turning occasionally. Carve steak across the grain into thin slices. Season with salt and pepper, as desired. Meanwhile prepare Crunchy Tortilla Strips. 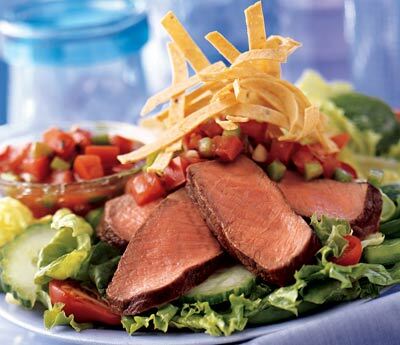 Add steak to salad mixture. Drizzle with dressing and top with tortilla strips. Heat oven to 400 degrees F. Cut 2 corn tortillas in half, then crosswise into 1/4- inch wide strips. Place strips in single layer on baking sheet. Bake 4 to 8 minutes or until crisp.